The Prince of Denmark wraps up act one, as he contemplates the morality of offing dear old Uncle Claudius. Christmas at Elsinore narrowly avoided becoming a rather awkward affair. Hamlet seemed a good character to go out on, and I like how he looks in full figure, complete, appropriately enough for the time of year, with spindly Jack Skellington legs. Zounds will now be taking a break for Christmas, but act two will kick off in the new year. I’m generally happy with the way things have turned out, so the recurring strands will continue. The introduction of two-parters toward the end of act one seemed to work, so there will be more of those and I would like to move towards longer stories – although I wonder if they might need a shorter turnaround between cartoons. 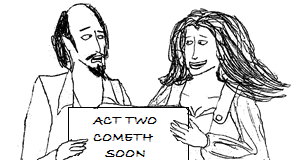 I definitely want to do more sonnets, and possibly more mash-ups – act one has hinted a few times at the idea that the various Italian-set plays inhabit the same fictional world, so I may return to that more explicitly. And there’s one famous play I’d never really considered Zounds material, but which I now find myself with a number of ideas for. If there’s anything you’d like to see from Zounds next year, feel free to leave your comments below. Have you a favourite play you’d like to see covered? Are there characters you’d like to see more of? When you get right down to it, is it all about Artemidorus? Feedback is gratefully accepted. But for now, thank you to everyone who has followed, supported and promoted the site these past few months. Merry Christmas to all, and to all a good night.